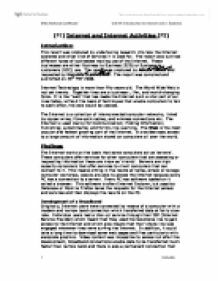 (P1) Internet and Internet Activities (P2) Introduction: This report was produced by undertaking research into how the Internet operates and what kind of services it is used for. The report also outlines different types of businesses making use of the Internet. These businesses are either Business to Business (B2B) or Business to customers (B2C) use. The report was produced by Haroon Sheikh and requested by Websters Supermarket. The report was compiled and submitted on 25th FBY 2008. Internet Technology is more than fifty years old. The World Wide Web is not yet twenty. Together they are a business-, life-, and world-changing force. It is the "web" that has made the Internet such a vital part of our lives today, without the basis of techniques that enable computers to talk to each other, the web would be useless. The Internet is a collection of interconnected computer networks, linked by copper wires, fibre-optic cables, and wireless connections etc. The Internet is used mainly for Communication; Finding Information; Publishing; e-Commerce; and for On-line Learning. The Web is the most popular and fastest growing part of the Internet. It provides easy access to a large amount of information stored on computers all over the world. Findings: The Internet works on the basis that some computers act as 'servers'. ...read more. Price set up by the market and linked to demand and desire ability. Can result in large cost savings. Reduce marketing, advertising and selling costs. Can buy second-hand items cheaply. 2. Banking Online - All the banks now offer both private and business customers to bank online. The customer first registers for online banking and is allocated a unique ID and password which must be keyed in to gain access to secure area on the bank's website. In this area customers can: Access all bank accounts held to see balances and transactions. Print out statements and other records. Transfer money between accounts, pay bills and even apply for a loan. Many banks offer online services including: Online share buying and selling through the bank's links with share dealers. Fast Pay where money can be transferred by SMS or email to another person or business used to pay for goods bought on the net when the site shows a Fast Pay button. Advice on many different aspects of starting and running a business, completing a tax return, paying wages, compiling a business plan and so on. I have found out that E-mail allows people to send messages from one computer to another using the Internet connection almost immediately. It is widely used and has become an alternative to the conventional letter post, the fax, and telephone. ...read more. The Internet is a linked network of computer networks. I have found out that with Banking Online, customers can do banking at any time of the day or night. 7 days a week, and from any Internet linked connection in the world. Without going anywhere near the bank an online customer can carry out almost every type of bank transaction apart from physically paying in or withdrawing money. I have also found that some chat-rooms are safer than others because they require users to register by providing their email addresses and also include safety features, such as 'ignore' buttons. Chat-rooms are not the only way of communicating over the Internet. Forums are also set up for professional collaboration between people working at a distance. They can be used to provide help and support for users as well as guidance and comments on communal projects. Job Sites are run by agencies that advertise vacancies on behalf of employers. For an additional fee they will also undertake other tasks, such as checking applications and advertising on shortlist. The last minute is also used successfully by many other operators, particularly in the field of travel, accommodation and holidays. Businesses who responded to the challenge, and supplied the products customers wanted, such as Amazon, Argos and Tesco saw the growth in sales. ?? ?? ?? ?? 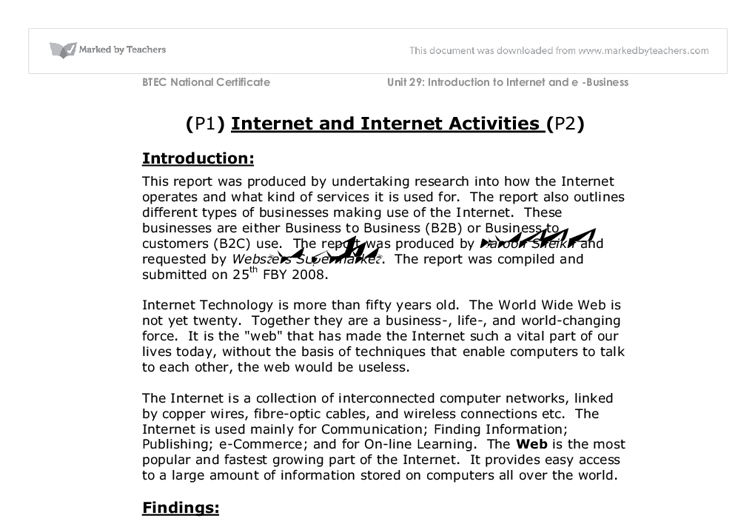 BTEC National Certificate Unit 29: Introduction to Internet and e-Business 1 H.Sheikh ...read more. see the whole width of the page without having to scroll horizontally, but only vertically. If however someone with a smaller screen, which is less likely, wants to use the website, he can do this, which will however be a little more difficult, but still without any major problems. 4.1 - Changing Culture The growth of technology in the 1990's which saw the Internet and personal computer boom offset a technological culture where people were making increased use of new technology in their daily lives and felt that they had to "keep up to date" with the latest technology to compete with "the Johnson's next door". In most cases, countries that are in poverty are more concerned about the basic things of life such as clean water, teaching, hygiene and putting food on the table, than they are about getting a computer so that they can access the internet as these are not the essential things in life when basic necessities are not present. a not-for-profit diving company is hosting a diving competition, using their list of competitive divers to invite them along to the NFP Diving Incorporated Competition. Introduction to Principles 3, 4 & 5 Principles 3, 4 and 5 are similar to each other and you should know how they are connected. size and Sam learning to help them prepare for their exams or get revision notes for coursework. This can help meet the second objective of being determined to perform well. Staff can use it to explore different schools in the city and see their progress and compare it to their own.